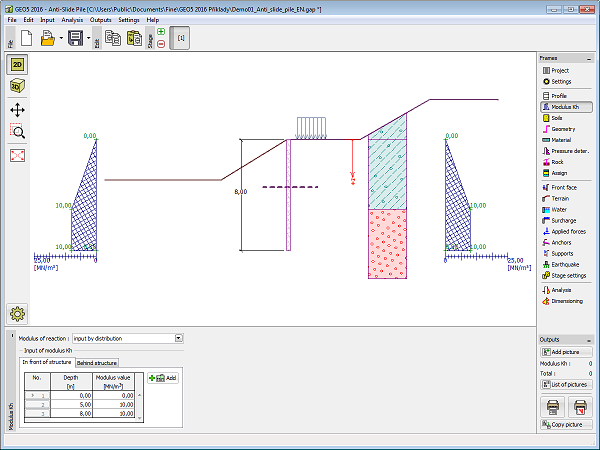 This frame serves to specify a type of analysis for calculation of the modulus of subsoil reaction, which is an important input parameter when analyzing a sheeting structure by using the method of dependent pressures. The way of calculation of the modulus of subsoil reaction kh is selected in the "Settings" frame (in the "Edit current settings" dialog window in the "Pressure Analysis" tab). Frame "Modulus kh" - selection "input by distribution"
Frame "Modulus kh" - selection "pressiometer Ménard"
Frame "Modulus kh" - selection "Chinese standards"